You've decorated your Southwest style home with beautiful art, furniture and accessories. Now all that's left is the bathroom. Look no more. 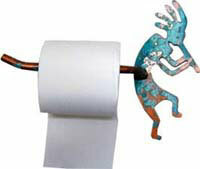 These beautiful Facing Kokopelli or Spirit Horses Towel Bars, Towel Hooks and Rings and Toilet Paper Holders are what you've been searching for. "I received the towel bar and toilet paper holder today. I must say, your products are lovely. So sturdy and well made. I am hoping for my contractor to install them next weekend. I will write after that, just to tell you how beautiful and unusual they look. As my husband said, "No one else will have these." Take care and thank you once again. By the way, the toilet paper holder was made the perfect size to fit in the smaller area." Make sure to take a look at our matching Kokopelli towel set.